I won't say I was exactly disappointed to come home to seventy degree weather after visiting snowy New York last week, but it did put me in the mood to try some new snowflake crafts. I found a mostly-empty squirt bottle of ketchup in the back of my refrigerator (yes, I do believe I could find just about anything in there). After pouring the remaining ketchup into another bottle and scrubbing it out, I used a funnel to fill the empty squirt bottle with pancake batter. Now I had a writing instrument for drawing whatever I liked! 2. I used a recipe for crepe batter instead of the traditional pancake batter with baking powder, etc. I thought the snowflakes might be prettier if the pancakes were flat, but crepe batter is very thin and runny. If you're not careful, you'll end up with a simple little pool of batter instead of a snowflake. The girls enjoyed watching the snowflakes being drawn on the griddle, but they especially enjoyed sprinkling them with powdered sugar afterward. 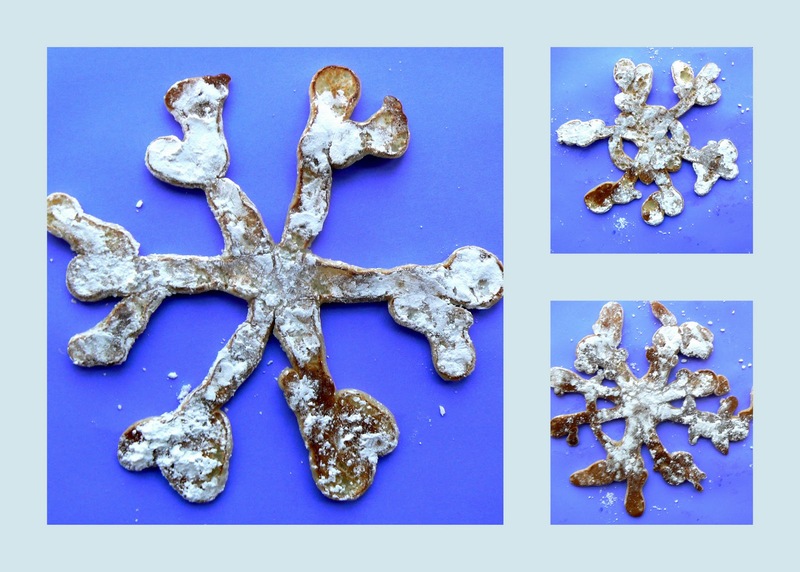 "Snowy" snowflakes are the prettiest and the tastiest!